Pc not matching download speeds with macbook and phone!! I don't understand why. I also have a ethernet through power adapter connected to my router/PC because my PC is in my bedroom Anyone had a similar issue ?!! I get around 30 Mbps less than what I do my MacBook and phone which are always over 90mbps Using my wifi. Última edición por ronnysingh el 05 Abr 2019, 00:20, editado 1 vez en total. Re: Pc not matching download speeds with macbook and phone!! Please in order to help your, post the specifications of your PC. Check the Ethernet cable, and try to use one better cable. Check also your ethernet drivers. 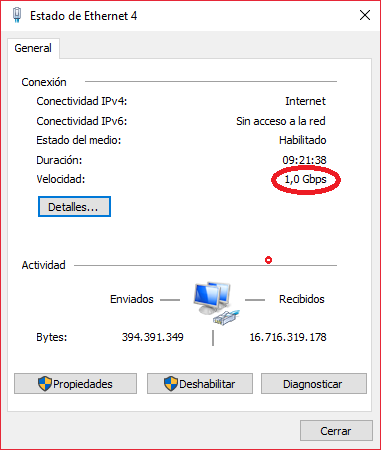 Check the speed of your NIC, in the Windows configuracion, and check what are the speed of your NIC. note: the speed of the picture maybe doesn't mach with your speed.